David Franklin Rowe, Sr., 80, was born 3 April 1938 in Linwood, to Edith Leonard and Jason Franklin Rowe. He was married to Martha Wilson Rowe for 59 years. In addition to his wife, he is survived by three sons: David Rowe (Wanda) of Clemmons; Mickey Rowe (Beth) of Elk Creek, VA; and Charles Rowe (Courtney) of Advance. He is also survived by five grandchildren: Brittany Rowe of Portland, OR; Morgan Rowe of Greenville; Brooke Rowe of Wilmington; Wilson Rowe of Clemmons; and Christi Rowe of Chattanooga, TN. Other survivors include a brother, Roy Rowe (Linda) of Lexington, a brother-in-law Vern Mecham of Mocksville, and in-laws Janice and Ray Wilson of Lewisville. He was preceded in death by his parents and his sisters, Mary Frances Rowe and Phyllis Rowe Mecham. Dave attended Mineral Springs Schools and Griffith High School, where he graduated, class of 1956. In his senior year he received a Certificate of Merit from the National Merit Scholarship Program and also was awarded a Navy ROTC Scholarship to Duke University. He spent the summer of 1956 training at the U.S. Naval Submarine Base in New London, CT, graduating Naval Submarine Class 134. At Duke University he enrolled in the School of Engineering. He was a member of the Duke NROTC Drill Team and Lambda Chi fraternity. After two years Dave left Duke with an honorable discharge from the US Navy and took the armed forces qualification test administered by the U.S. Army. He made a perfect score. His tour of duty in the Army was with guided missiles at Ft. Bliss in El Paso, Texas, where he was a Nike Ajax fire control technician at a radar station in the desert. As a teenager Dave found an after-school job at Flynn’s Drug Store on East Clemmonsville Road and that is where he met his future wife. Martha lived across the street from the drug store and soon took notice of the new soda jerk. David Franklin Rowe and Martha Clinard Wilson were married 14 June 1959 at New Friendship Baptist Church. Dave was graduated from High Point College in 1963. He worked for Sears Roebuck as store controller in Roanoke, VA; Durham; and Petersburg, VA. He was employed by the Hanes Corporation where he was the Production Control Manager of the Weeks hosiery plant, the Administrative Manager of Today’s Girl hosiery, and the Director of Purchasing and Production Planning for the Bali Co. in New York. After leaving the textile industry, Dave joined Tri-City Building Components [the Blue Ox Co.] in Kernersville as VP of Sales, and later VP of Manufacturing and VP of Operations. He co-authored a manual that became a mainstay of the industry: Wood, Roof & Floor Truss Systems; Standard of Design. For the remaining years of Dave’s career he was a partner of A.L. Cook/Pro-Buff in Greensboro, part owner and president of Wholesale Builders Supply in Colfax, and self-employed as a building contractor. He described himself as a Manager of Change, and a Generalist with significant skills and experience in a variety of fields. Dave was active in Clemmons Moravian Church, where he was a member and former teacher of the Fellowship Class, a Trustee, and served on the Board of Evangelism and Home Missions of the Moravian Church Southern Province. His community involvement included president of Clemmons Civic Club, Cub Master Clemmons Troop 736, Secretary and Board of Directors Administrative Management Society, Y Men’s Club, and Board of Directors Superior Truss Co. in Liberty. He was a Charter Member and Paul Harris Major Donor of the Clemmons Rotary Club, where he received a Lifetime Rotary Award. Dave and Martha were adventure travelers, visiting all fifty states and all the continents except Antarctica. Dave and his boys all owned off-road motorcycles, and he enjoyed the good times they had riding together. For half his life he and Martha, and early on the boys, camped and explored in RV’s. Dave always wanted to see what was over the next hill, and never forgot the magic of wild places. He was a fan of gospel music and vintage car restoration. At age 43 he earned his pilot’s license. He was a free-thinker and an entrepreneur. For his parents’ retirement years he built an innovative envelope house in Midway. He was most proud of the unique house he designed and built on the Yadkin River for his and Martha’s own retirement years. That is his legacy. Dave lived his strong belief that character and integrity are the most important strengths a person can have. 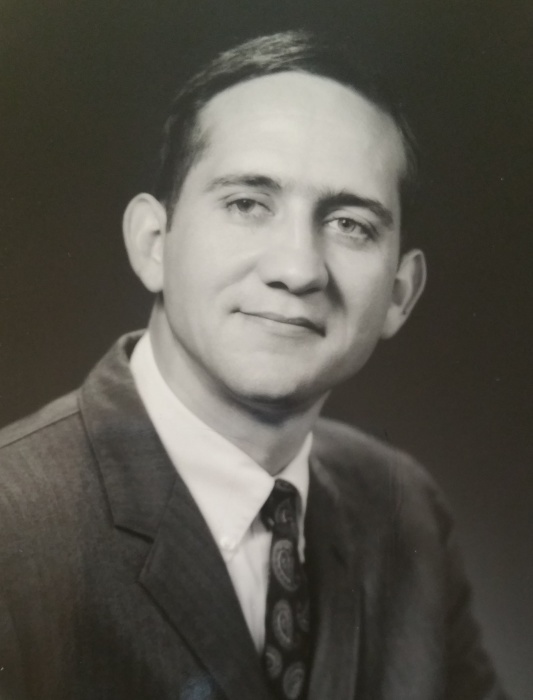 He was a faithful Christian servant and a loving and supportive husband, dad, and granddad. His mind retreated into the shadows of Alzheimer’s Disease during his last years. His dog Sandy was his constant companion. Dave passed away peacefully on Saturday, February 9th, 2019, in Winston-Salem. The family will receive friends at Hayworth Miller Kinderton Chapel Tuesday, February 12, from 5:00 to 7:00 p.m. A funeral service will be held Wednesday, February 13, at 10:30 at Clemmons Moravian Church, 3535 Spangenberg Avenue. The burial will follow the service at the church graveyard. In lieu of flowers, memorial contributions can be made to Wake Forest Baptist Medical Center - Alzheimer’s Research. Online condolences may be made at www.hayworth-miller.com.